SIGN THE PETITION: Save the Pilitas Stairs! A proposed new seven-story condo tower at the end of Calle Pilitas, where it intersects with Pino Suarez (on paper, anyway) threatens the location of the stairway that historically connected Amapas residents near the highway with neighbors on Pilitas and provided pedestrian access to the beach. The stairs were destroyed during the construction of 212 Pilitas several years ago and, despite the developer’s promises to neighbors, never rebuilt. Thanks to our generous contributors, we raised almost $100,000 pesos for Phase One. The funds were kept and accounted for separately, and a detailed financial report was sent to all contributors. Total costs were $125,885.35 pesos, an overage of $28,445.45, much of which was the result of inflation during the summer due to increased gas prices. ANA covered the additional Phase One costs from its other funds. 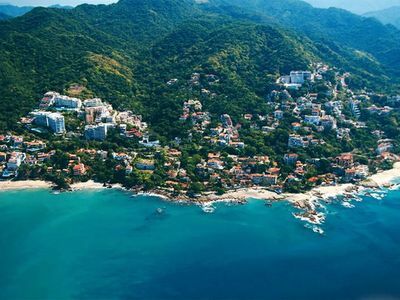 Several months ago, ANA began receiving complaints and requests from neighbors about the ‘Caballito Stairs,’ a narrow pedestrian stairway running down to the beach from Calle Santa Barbara, between Almar Resort and Vallarta Manor (at the top) and Vallarta Shores (at the beach): the bottom 12-15 feet of stairway were missing. Obviously, this can be a real safety problem, especially at night. And then, a couple of months ago, the Amapas Junta Vecinal received a petition about, among other things, rebuilding the stairs. 1. 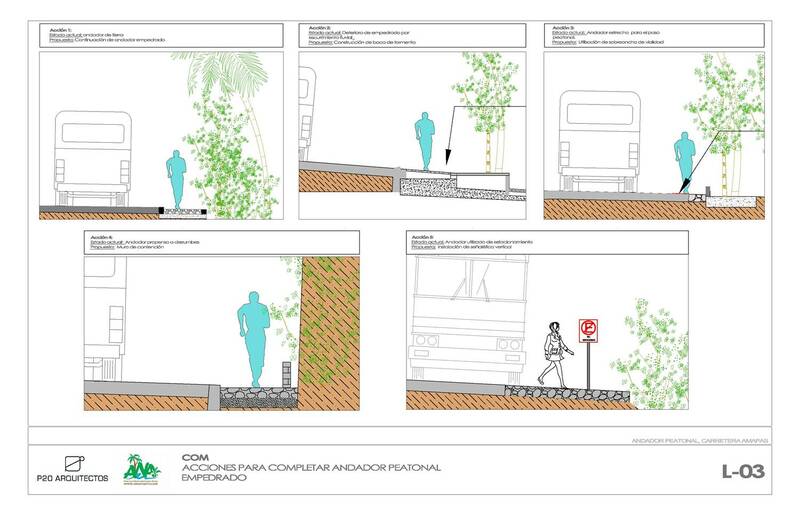 Green zones incorporated in the Amapas Plan Parcial as such. This refers mainly to the jungle areas above the built parts of Amapas, and the area between Horizon/Rio Amapas to the north and Real de Conchas Chinas to the south (“Rio Amapas”). These are designed for natural activities only. In the past few months, neighbors raised concerns about possible development in the Rio Amapas zone. 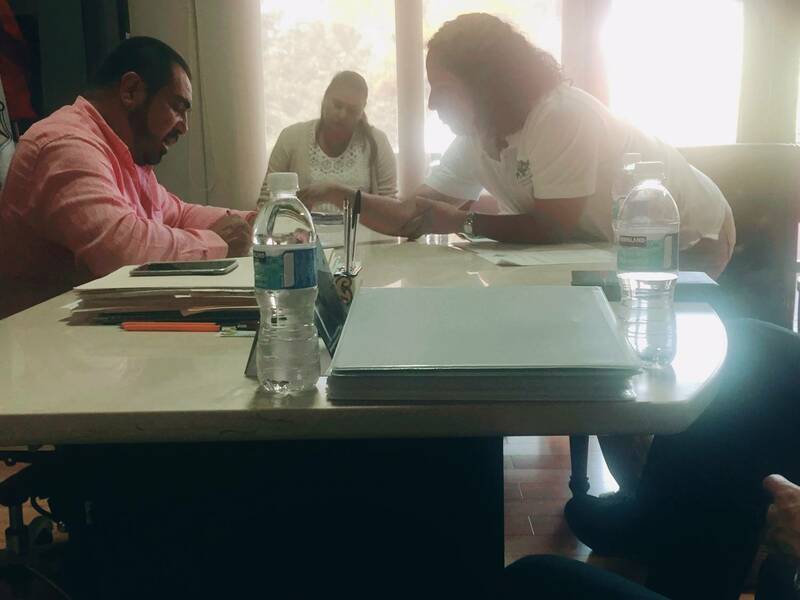 ANA sent letters to the current interim mayor Rodolfo Dominguez and to the mayoral candidate and likely next mayor Arturo Davalos petitioning that the city from allowing any development in that zone. 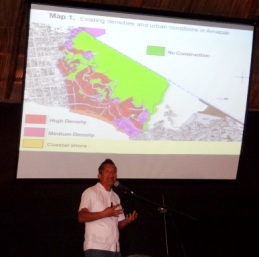 A similar petition was submitted by a prominent AMPI member on behalf of Conchas Chinas.Another prominent AMPI member had the opportunity to bring up this issue when meeting with Arturo Davalos and was given reassurances that are no plans to allow development either in Rio Amapas in the Conchas Chinas green zones. Due our conversations with the police during our meetings of VEA (Vecinos En Alerta) program, which is a sort of Neighborhood Watch on steroids. The police identified a need; They would like to learn more English. 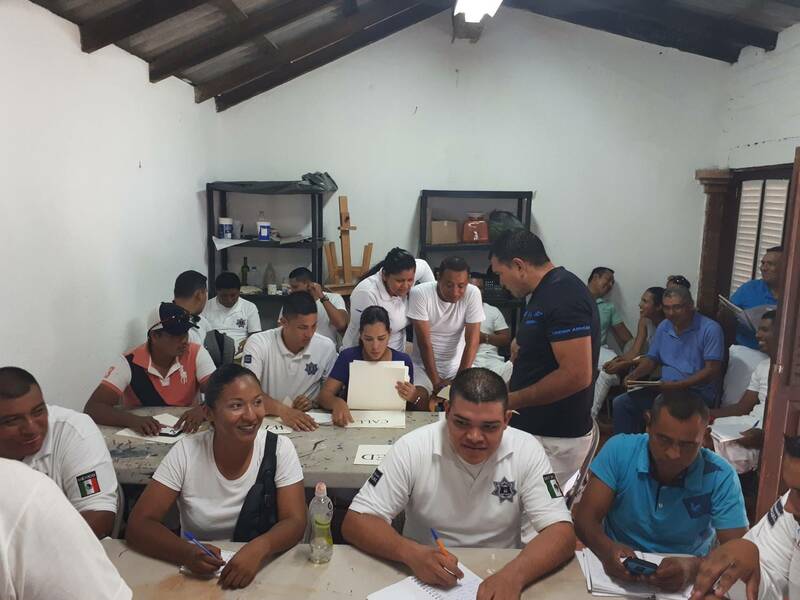 Amapas Neighborhood Association with the help of Viviana Testón, Steve Ross and Carol More taught 3 months of English classes for our police department during the summer. We are looking to continue with the program, during the winter, now that our members are back, It can be a great oportunity to practice your Spanish and help the comunity. 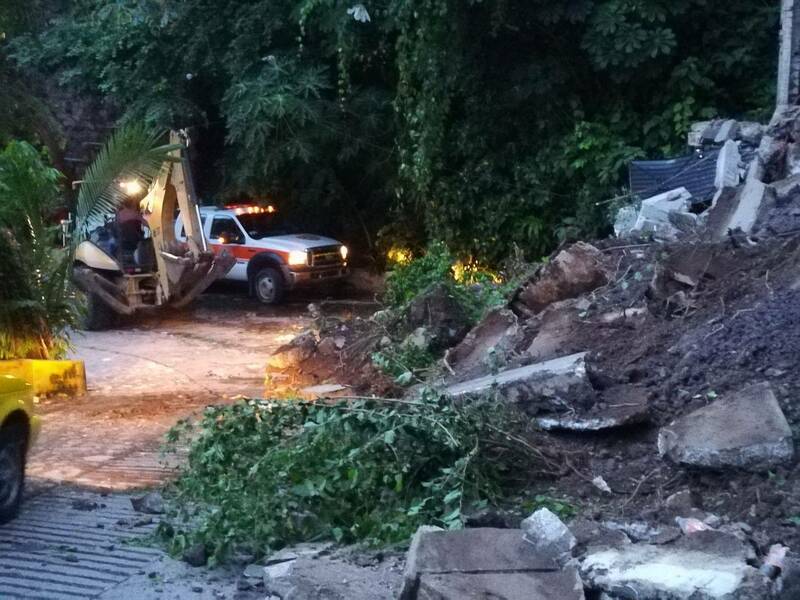 ANA also alerted and coordinated with Proteccion Civil, Planning Department and Obras Publicas when a portion of Villa Lucia’s retaining wall, on Gardenias, opposite Brisas Lunar, came down during our heavy rains. 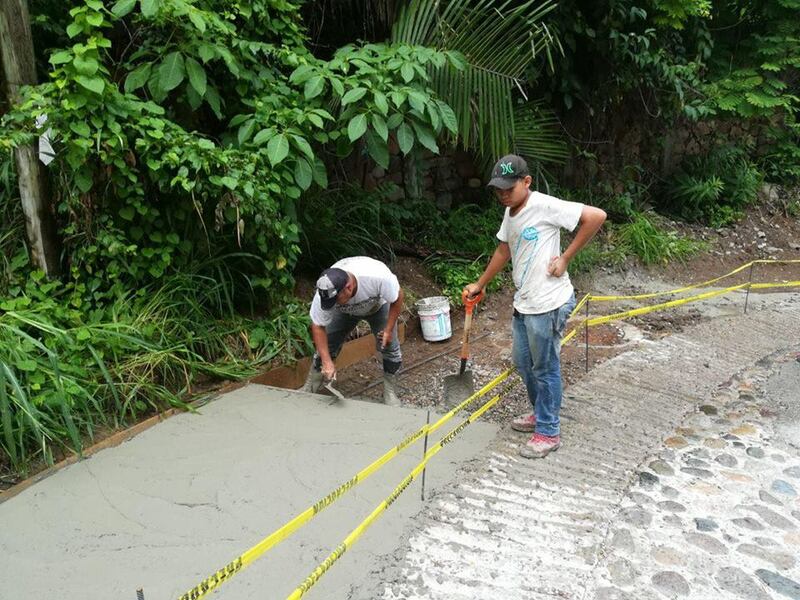 The Owners of Villa Lucia, with City oversight, are finishing a new, and better-drained, poured concrete replacement, making our hillside neighborhood safer. 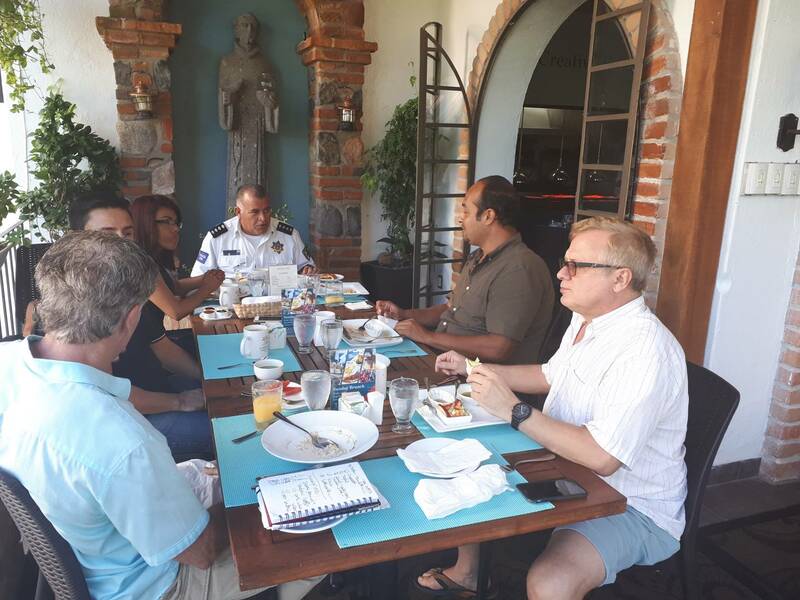 At an October 19 breakfast meeting with ANA Board members, Transito Director Everado Rubio agreed to rearrange the ‘topes’ – AKA ‘speed reductors’ – at the Highway 200/Callejon de la Igualdad intersection so reckless drivers can’t avoid them by driving in the oncoming traffic lane. In the coming weeks, Transito also promised to repaint our crosswalks and center line, and add ‘Topes Ahead’ warning signs. As always, ANA will be covering the cost of materials to get the job done. 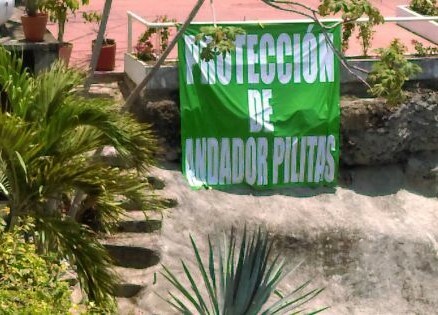 During 2017 ANA has sent several official letter to Mayor Davalos, with copies to the relevant City Departments – Obras Publicas, Planning, Proteccion Civil, and Transito – requesting among another things a written statement of City Hall’s response to the report of our Civil Engineer, declaring imminent danger of collapse where erosion has significantly undermined the Los Pinos pavement. Is there a danger to property and access…or not? Obviously, once danger is officially recognized, some action must be taken. Your ANA is reaching out to members of the local Spanish-language media to bring public awareness and opinion to bear on the problem. It all started back in 2000, when a group of Amapas neighbors banded together to protect themselves against aggressive developers who had moved into then-tranquil Amapas with little regard for their new neighbors. And the rest, poco a poco, has become our history. 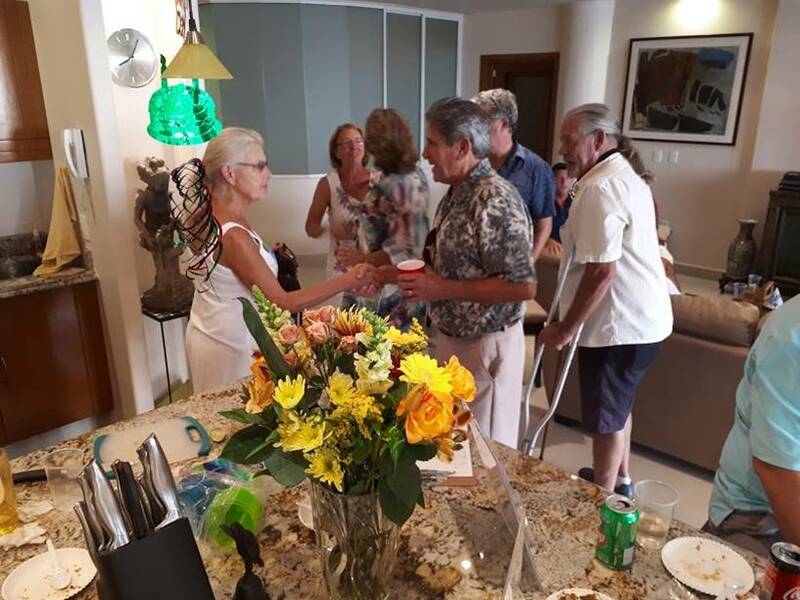 During one of our meet & greets of this year, We celebrated our 17th birthday at ANA’s August Meet-and-Greet, hosted by Steve Ross and Board member Sylvia Toy. Over two dozen ‘hard-core’ summer residents brought appetizers and wine to share. Founding President Susan Wiseman and long-time Board member Rolf Engstrom were recognized for their service with Certificates of Merit, and each shared personal memories of ANA’s founding and evolution. We had party-hats, balloons, free-flowing Margaritas…and there was cake! Amapas Neighborhood Association has an excellent relationship with our local police. That’s one reason they invited our colonia to participate in the new VEA Program (Vecinos En Alerta)– a sort of ‘Neighborhood Watch on steroids’ with an added Whatsapp element to ensure a rapid response in crime emergencies. It’s all about crime prevention and community participation, which is where we come in. As part of the program’s roll-out, police have had good turnout at four ANA-sponsored informational neighborhood meetings, including two walking tours with local residents, identifying unsafe or potentially dangerous areas for particular police attention. One thing that makes VEA different from a typical Neighborhood Watch is that this program is sponsored by the police, so they’re ‘all in.’ Another is VEA’s ‘Emergency Only’ Whatsapp group, which is monitored by the Police Chief himself, his deputies and watch commanders. 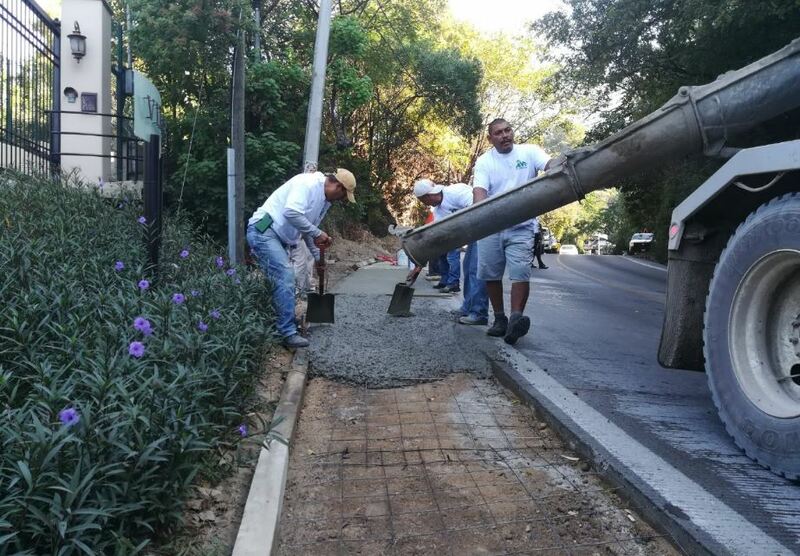 ANA’s Hortensias Repaving Project is now complete, including an additional meter of grooved cement track, making that 90 degree turn coming up the hill passable to cars coming in opposite directions. 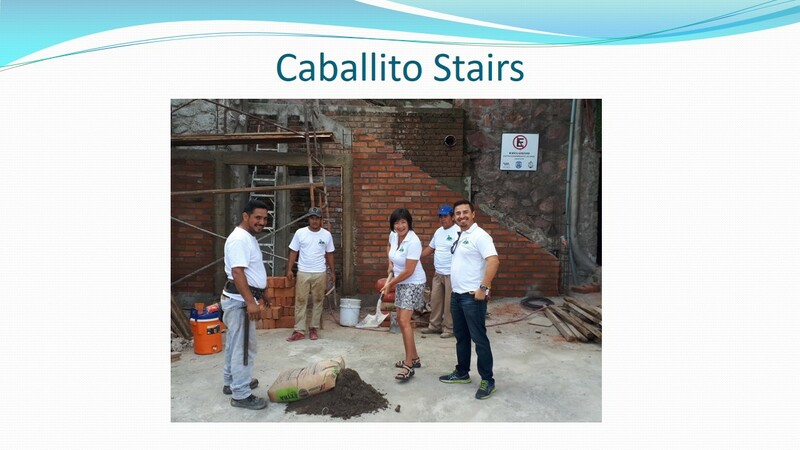 Thanks to our many Full Building and Individual Members who contributed over $260,000 pesos to get the job done! 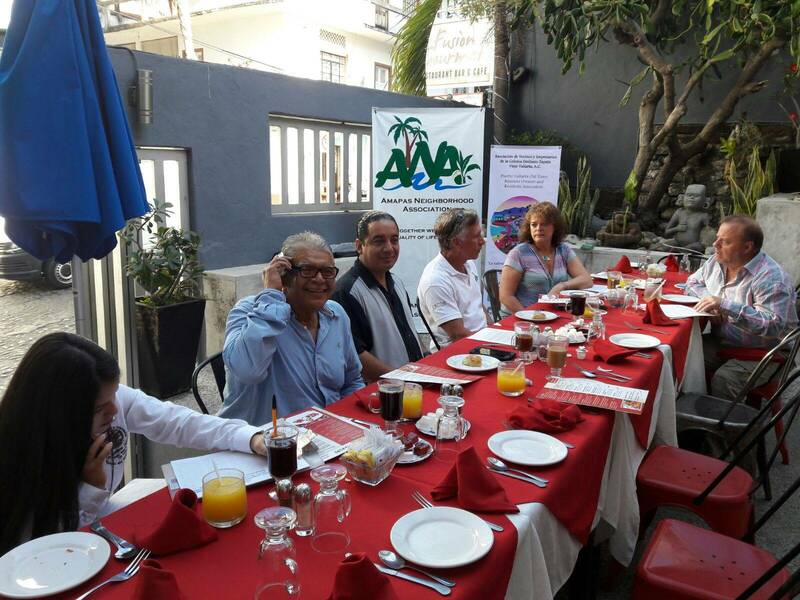 On March 23, mostly Gringo ANA co-hosted our first bilingual, bicultural celebration of international friendship with mostly Mexican sister association Viejo Vallarta(part of Emiliano Zapata) at the Lions Club, and it was a blast. Over 300 guests sampled great food provided by 40 top Vallarta restaurants and caterers, accompanied by Mariachi music. Margaritas flowed freely, along with goodwill, as Mexicans, Canadians and U.S. citizens dined and drank together, enjoying some amazing folkloric dancing, as well as Act II Stages star Brittany Kingery, who channeled Linda Ronstadt’s Canciones De Mi Padre. 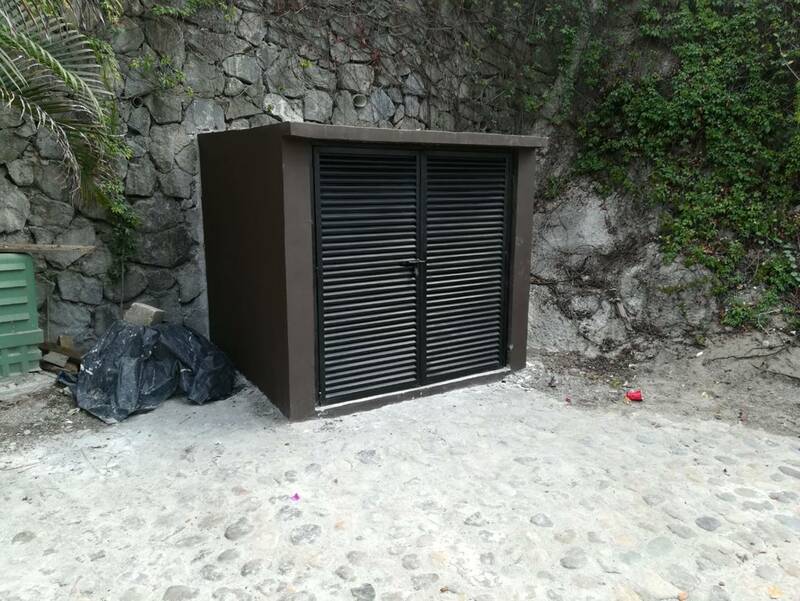 To help keep trash off our streets between pickups, your ANA had a partnership program with Villas de la Colina II on this new ‘trash shack.’ we’ll get City permission, handle construction, and split the cost to build a trash containment structure that keeps your trash out of sight and away from stray animals and dumpster divers. Now that the summer rains have finally stopped (we hope), a construction crew on loan from Obras Publicas will begin construction of Phase One of our new Highway Sidewalk, opposite Paramount Bay in the next two weeks. Special thanks to those members and neighbors who contributed almost $100,000 pesos to jump-start the project! The overhead wires on Pulpito, between the Pinnacle Funicular and the beach, are an unsightly rat´s nest, and the sidewalks are narrow and dangerously broken. Plus, except for the lights in Coco´s Tree, the street is pretty dark. But ANA has a plan to change all that. 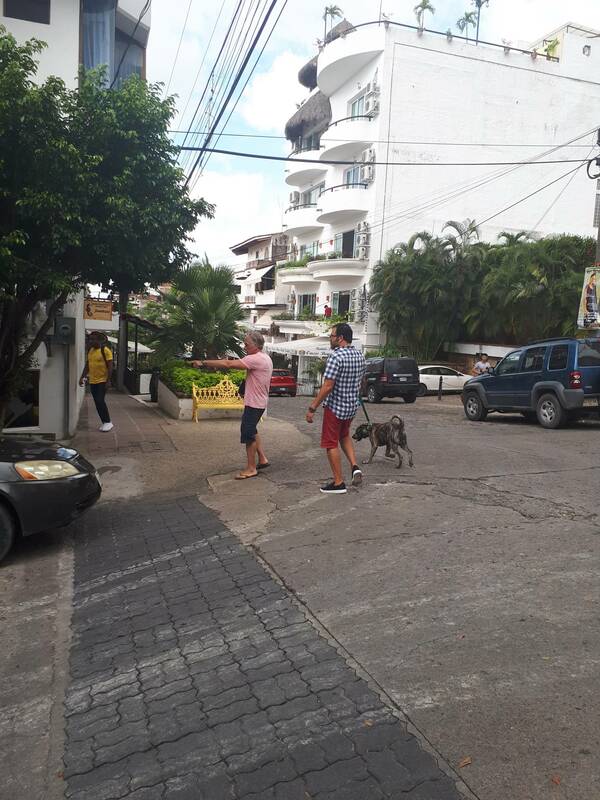 Using the proceeds from this year´s Pulpito Drag Derby, and working with City Hall´s Planning Department, CFE, Telmex and ANA member/local hotel owner Oscar Moran, we are funding and creating an Executive Plan for Calle Pulpito. It will combine and coordinate taking the overhead wires underground, improving the existing sidewalks, and adding planters and new street lighting. Once the Executive Plan is complete, ANA will present it to City Hall for review, funding and execution. Stay tuned! 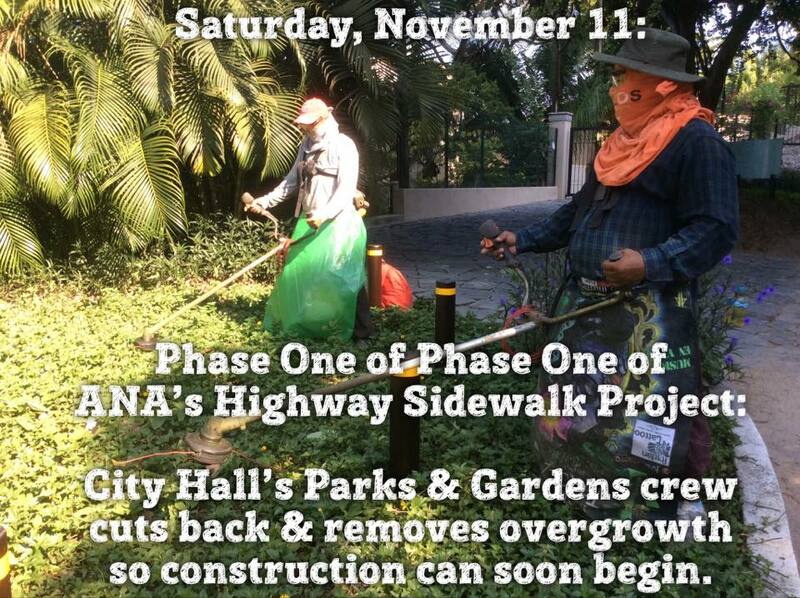 City Hall’s Parks & Gardens crew cut back & removed overgrowth so construction can soon begin. Explaining Plan Parcial to ANA members at 2013 Annual Meeting. Responsible Development: Fighting for responsible development which is according to the law and respects the character of Amapas without violating the rights of other property owners. 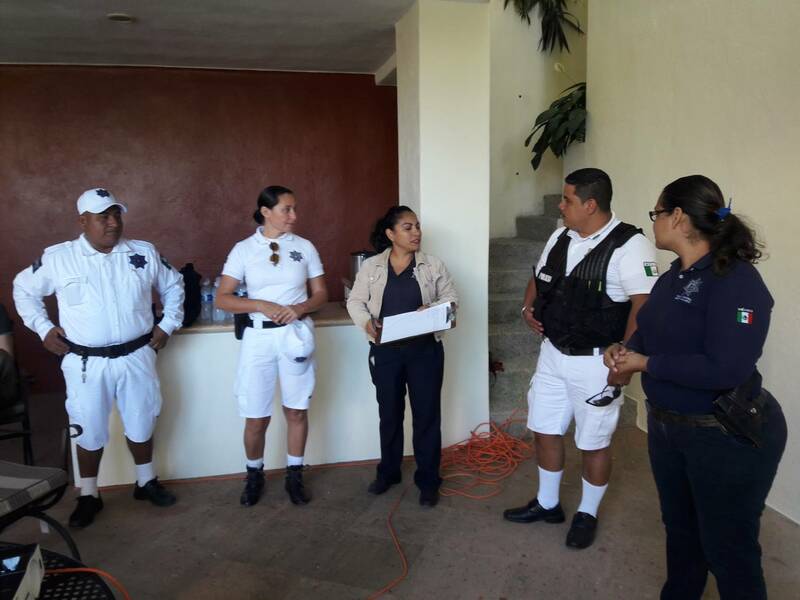 Security: Working with Puerto Vallarta’s Public Safety to keep Amapas Secure. ANA also sponsors TaxiSafePV, which investigates problems caused by corrupt police or taxi driver. Streets/Infrastructure: Maintenance and improvement of streets, lighting, drainage, garbage areas, signage and much more. This is a city responsibility but ANA must push to get it done, and contributes with our own efforts. Membership/Social: Events such as Amapas Night Out, fundraisers, social gatherings, and membership communications.